This month marks the 600th anniversary of the Battle of Agincourt and to mark the occasion, we’re looking at 10 of London’s “battlefields” (well, maybe not officially recognised battlefield sites but 10 places where fighting took place – or, as in this instance, legend says took place – at various times throughout London’s history). First up it’s to King’s Cross, once said to have been site of a village known as ‘Battle Bridge’, so named because, according to tradition, it here in about 60AD that the rebellious hoards of Queen Boudicca (also known as Boadicea or Boudica) ran into the well-disciplined army of the Roman Governor of Britain, Gaius Suetonius Paulinus. Paulinus had been campaigning in northern Wales when the Iceni rebellion broke out in East Anglia, apparently sparked by the Romans’ refusal to honour the will of the deceased King Prasutagus. He had left his land to the Emperor Nero and his two daughters but instead, the story goes that the Romans seized the land, flogged his wife Boudicca and raped his two daughters. Understandably incensed at this treatment, the Iceni and members of other tribes rose in rebellion under Boudicca and laid waste to the Roman city of Camulodunum (what is now Colchester in Essex). Boudicca then turned toward Roman Londinium, the provincial capital, and while Paulinus beat her there with a small number of troops, he quickly concluded he couldn’t defend it and ordered it evacuated. Boudicca, who is claimed to have fought from a chariot, and her army of tribesman apparently spared no-one when they arrived and burnt it to the ground. They then moved on to attack another Roman city – Verulamium (St Albans). Paulinus, meanwhile, marshalled his forces – still apparently vastly outnumbered – and chose his battleground carefully. One legend suggests King’s Cross – then site of an ancient bridge across the River Fleet – as the battle’s location (although we should mention there are also numerous other sites which have been suggested as the location for the battle including locations in the Midlands along the Roman road of Watling Street, now the A5). Where-ever it was, Paulinus had apparently chosen his position so that Boudicca couldn’t bring her greater numbers to bear on his flanks. Her army collapsed and, according to the Roman historian Tacitus, there was a rumour that 80,000 Britons were killed and just 400 Romans in the ensuing battle (although fair to say such numbers may be a stretch!). The outcome was obviously devastating for Boudicca – there’s various accounts of what happened to her next with one being that she fell during the battle and another that, having survived, she committed suicide by poisoning herself. There is a legend that Boudicca was subsequently buried at a site now covered by platform nine or 10 at King’s Cross railway station. It’s also been suggested she was buried at Parliament Hill. 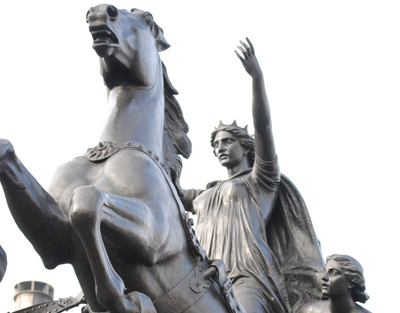 There’s a statue commemorating Boudicca and her daughters (pictured above) at the western end of Westminster Bridge. Designed by Thomas Thornycroft, it was made in 1850 but not erected on the site until 1902.